Performable Comedy Collection. 120-140 minutes (flexible). 6+ females, 4+ males (11-100+ performers possible--8 or fewer if not all 12 plays are produced). High school and older performers (with many plays being suitable for advanced middle school performers), and middle school and older audiences. The plays may be performed in any order (and with any titles left out). 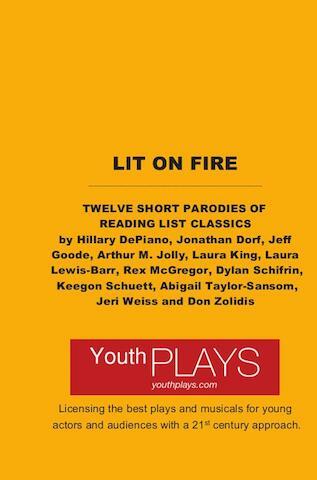 To perform any play in this collection individually, please visit its dedicated page. They may have appeared on your high school reading list, or maybe only in your nightmares, but now twelve YouthPLAYS authors are striking a match and burning down the classics...with their pens and computer keyboards. Whether it's the complete works of Jane Austen gone full-on Hollywood, Count Dracula as a cafeteria cook, or Huck Finn running away from his story only to have it catch up with him again--to name just a few--get ready to light up the literary canon with this scorchingly funny new collection.